HIV-1 Tat hijacks the human superelongation complex (SEC) to promote proviral transcription. Here we report the 5.9 Å structure of HIV-1 TAR in complex with HIV-1 Tat and human AFF4, CDK9, and CycT1. The TAR central loop contacts the CycT1 Tat-TAR recognition motif (TRM) and the second Tat Zn2+-binding loop. Hydrogen-deuterium exchange (HDX) shows that AFF4 helix 2 is stabilized in the TAR complex despite not touching the RNA, explaining how it enhances TAR binding to the SEC 50-fold. RNA SHAPE and SAXS data were used to help model the extended (Tat Arginine-Rich Motif) ARM, which enters the TAR major groove between the bulge and the central loop. The structure and functional assays collectively support an integrative structure and a bipartite binding model, wherein the TAR central loop engages the CycT1 TRM and compact core of Tat, while the TAR major groove interacts with the extended Tat ARM. The human immunodeficiency virus-1 (HIV-1) remains one of the world’s leading health threats. In spite of advances in treatment with antiretrovirals (HAART) (Yeni 2006), it has not been possible to eradicate HIV-1 infection. Even under intensive antiretroviral therapy, resting T cells that harbor latent provirus integrated into their genome survive (Archin et al., 2014). The pool of latent virus is the primary obstacle to eradicating HIV, and thus the mechanisms by which latency is regulated are of paramount interest. The molecular mechanisms regulating HIV-1 transcription have been studied for three decades, yet renewed interest in eradicating HIV-1 infection has lent new urgency to obtaining a more complete understanding. Proviral transcription is silenced by host epigenetic mechanisms and/or deficiency in key cofactors, and is reactivated at the level of both initiation and elongation (Mbonye and Karn 2014; Zhou et al., 2012; Jonkers and Lis 2015). Transcription of the HIV-1 proviral DNA is initiated by RNA polymerase II (Pol II) binding to the HIV promoter, but stalls after a 30–50 nucleotide transcript containing the trans-activation response region (TAR) is formed. 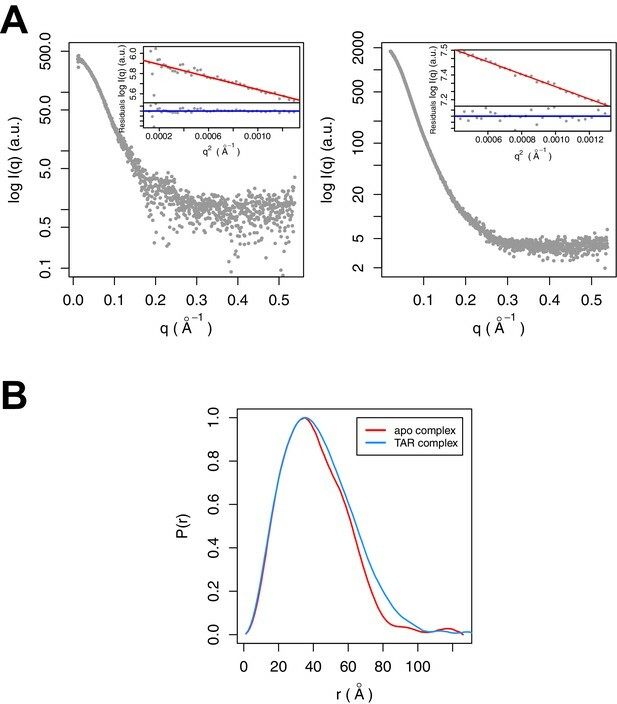 Release of the stalled Pol II is dependent on the recruitment of the host super elongation complex (SEC) (He et al., 2010; Sobhian et al., 2010) to the nascent TAR by HIV-1 trans-activator protein (Tat), a central driver of proviral transcriptional activation (Fisher et al., 1986). The SEC is assembled on the AFF1 or AFF4 scaffold protein that interacts through small binding domains with the positive elongation factor b (P-TEFb), composed of CDK9 and Cyclin T1 (CycT1), the transcription factor ELL1/ELL2, and ENL/AF9 (Chou et al., 2013; He et al., 2010; Lin et al., 2010; Sobhian et al., 2010). P-TEFb facilitates promoter escape by phosphorylating two negative elongation factors (DSIF and NELF) as well as the C-terminal domain of Pol II. Overexpression of full-length AFF1, but not a fragment that only binds to P-TEFb, strongly increases Tat transactivation of transcription from the HIV promoter (Lu et al., 2014), indicating that productive HIV transcription requires the whole SEC. Recent crystal structures have revealed how the intrinsically disordered P-TEFb-binding domain of AFF4 folds and binds in a hydrophobic groove on the CycT1 surface (Schulze-Gahmen et al., 2013; Chou et al., 2013). HIV-1 Tat binds to CycT1 in an extended conformation adjacent to AFF4, interacting with residues in the cleft between the two cyclin-fold domains of CycT1, the Tat-TAR recognition motif (TRM), and AFF4 helix α2 (Schulze-Gahmen et al., 2014; Tahirov et al., 2010; Gu et al., 2014). Segments from AFF4, Tat, and CycT1 TRM that are flexible in isolation come together to form a more stable structure with a positively charged surface (Schulze-Gahmen et al., 2014). Biochemical experiments have shown that both Tat and CycT1 make critical and direct contributions to TAR binding (Calnan et al., 1991; Richter et al., 2002b; Garber et al., 1998). In the presence of AFF4, TAR affinity to P-TEFb increases sharply (Schulze-Gahmen et al., 2014). The exact mechanism for the increase in affinity has been unclear, in part due to the lack of a structure of the SEC complex with HIV-1 TAR. To fill the gap in structural understanding, we determined the structure of TAR bound to Tat:AFF4:P-TEFb. We validated our low resolution crystal structure of the TAR complex with data from small angle X-ray scattering (SAXS), hydrogen deuterium exchange (HDX), selective 2’-hydroxyl acylation analyzed by primer extension (SHAPE), binding assays, and previously published biochemical data. The structure of TAR bound to Tat:AFF4:P-TEFb reveals extensive interactions between the TAR loop and a composite protein interaction site, composed of CycT1 TRM and the Tat Zn2+-coordination loop, Tat residues 24–29. Although the Tat ARM is not visible in the electron density maps, its predicted location based on the Tat core position is close to the TAR bulge region in the crystal structure. This constraint, together with biophysical data, were used to develop an integrative model of the ARM, showing it bound through the length of the TAR major groove. AFF4 has no direct contacts with bound TAR in our crystal structure. Instead AFF4 is interacting with the CycT1 TRM and the second Tat Zn2+-coordination loop. Hence, its stimulating activity on TAR binding is likely due to stabilization of the TAR interaction surface of Tat:P-TEFb by AFF4. Our results provide the first structural model, albeit at low resolution, of a critical regulator of HIV-1 latency, the Tat:SEC:TAR complex. To localize the regions of the Tat:AFF4:P-TEFb complex that undergo HIV-1 TAR-induced conformational changes, we performed hydrogen-deuterium exchange mass spectrometry (HDX-MS). The HDX rate of a protein region depends on its flexibility, the amount of hydrogen bonding with backbone amides, and solvent accessibility (Hoofnagle et al., 2003; Percy et al., 2012). We compared absolute deuteron incorporation into different segments of Tat:AFF4:P-TEFb in the absence (apo complex) and in the presence of saturating amounts of HIV-1 TAR (TAR complex) (Figure 1A). The observed peptic peptides of the apo complex covered more than 80% of the Tat:AFF4:P-TEFb sequence (Figure 1—figure supplement 1–3). Our HDX data of the apo complex in solution are in good agreement with the crystal structure of Tat:AFF4:P-TEFb (Schulze-Gahmen et al., 2014; Gu et al., 2014) (Figure 1A). The C-terminal segment (residues 59-67) of the synthetic AFF4 peptide (32–67) shows 70% deuteration after 10 s and almost complete deuteration within 3 min (Figure 1B). Although the crystal structure indicates an α-helix in this region, high B-factors indicate high mobility and partial unfolding of this terminal helix in solution, in agreement with the high deuteration levels observed in the HDX experiment. The Tat-TAR recognition motif (TRM; residues 246 to 262 in CycT1, (Das et al., 2004; Garber et al., 1998) also showed almost complete deuteration within 10 s in the apo complex (Figure 1B), which is consistent with multiple conformations for the TRM in the crystal structure (Schulze-Gahmen et al., 2014). TAR-dependent changes in the Tat:AFF4:P-TEFb complex. (A) Structure of the Tat:AFF4:P-TEFb complex colored according to the absolute percentage of deuterons incorporated in the presence and absence of TAR after 30 s in D2O. (B) TAR-dependent HDX kinetics of selected segments of Tat:AFF4:P-TEFb complex. Segments with more than 2.5 and 1 amide hydrogens protected in the presence of TAR at time‐point 10 s are colored in dark and light blue, respectively. The HDX kinetics for these segments in the absence of TAR (black) and the presence of TAR (cyan) are shown. Compared with the apo complex, we observed strong protection for the CycT1 TRM and AFF4 helix α2 (residues 59–65) after TAR binding (Figure 1B, dark blue segments) (Figure 1—figure supplement 1–3). These two segments are adjacent to each other in the crystal structure of Tat:AFF4:P-TEFb, consistent with their mutual cooperation in forming the TAR binding site. In contrast to CycT1 and AFF4, Tat exhibited a lesser degree of protection, localized to the N-terminal segment (residues 1-33) (Figure 1B, light blue segments). Surprisingly, the Tat ARM did not show any significant protection in HDX after TAR binding despite its well-established role in TAR binding (Weeks and Crothers, 1991; Calnan et al., 1991) (Figure 1B). This observation indicates that Tat ARM–TAR interactions are mediated primarily by amino acid side chains, without extensive hydrogen bonding and solvent exclusion of main-chain amide protons. We performed SHAPE analysis (Merino et al., 2005) to map the interactions of the Tat:AFF4:P-TEFb complex on the HIV 5’UTR, which includes the TAR sequence at its 5’ end. Experiments were done using the 344 nt-long 5’ end of the HIV genome (Heng et al., 2012) in the presence and absence of the Tat-AFF4-P-TEFb complex. Upon protein complex binding, the major SHAPE changes cluster in the 5’ TAR region of the 5’UTR (Figure 2A,B) with significant SHAPE changes observed around the bulge region at A17, the bulge region A22-U25, as well as the loop region C30-A35. As expected, no significant reactivity changes were observed in the regions 3’ to TAR. The SHAPE reactivity for some nucleotides in bulge A22-U25 and loop C30-A35 is extremely high (above 3) in the absence of Tat:AFF4:P-TEFb and remains high even after Tat:AFF4:P-TEFb binding. TAR binding reduces SHAPE reactivity by 0.3-0.4 and 0.2-1.2 for nucleotides in the bulge and loop region, respectively. The pattern of changes in SHAPE reactivity for TAR after binding the SEC is significantly different from changes observed after TAR binding to a Tat peptide covering the ARM region (Kenyon et al., 2015). This difference is expected because of additional contacts between CycT1 and TAR, which lead to higher affinity and more specific interactions between TAR and the SEC (Richter et al., 2002b; Zhang et al., 2000) compared to interactions between TAR and a small arginine-rich peptide from Tat. Because reduction in SHAPE activity correlates with reduced flexibility of the respective RNA regions (McGinnis et al., 2012), the results for the TAR-SEC complex indicate a stabilization of the bulge and loop structure through direct contacts between TAR and the SEC (Figure 2). 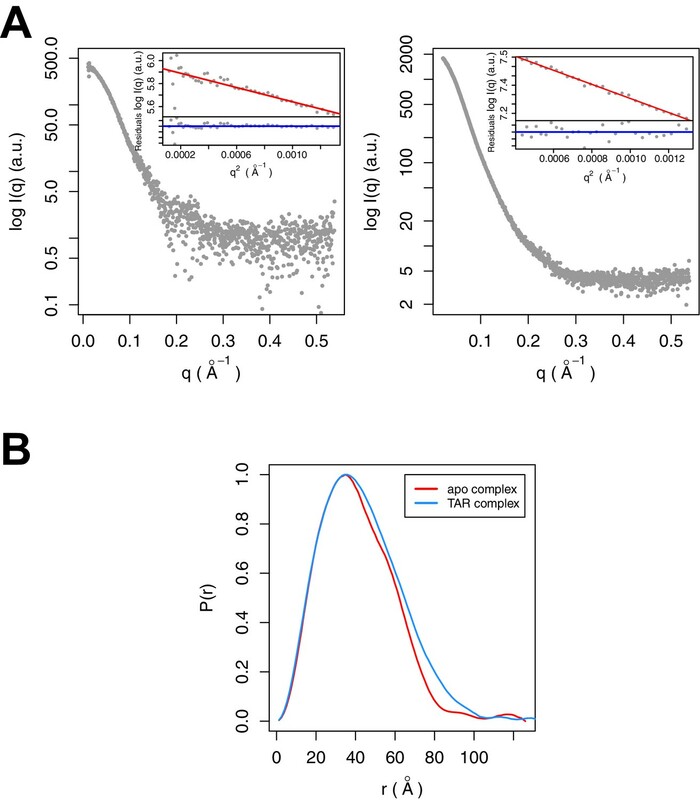 SHAPE profiles of the HIV-1 5’UTR in the presence and absence of the SEC. (A) SHAPE reactivity of the entire HIV-1 5’UTR either alone or in complex with the SEC are shown in red and blue, respectively. SHAPE reactivity profiles are normalized using the 2/8 rule, where the top 2% of reactive nucleotides are excluded and the average of the next 8% of reactive nucleotides is used as the normalization factor. The left insert is a zoomed-in view of the TAR region. The right insert shows the secondary structure of TAR color-coded by the SHAPE profile of the TAR region alone and the SHAPE changes in the TAR region upon SEC binding. (B) SHAPE changes of the HIV-1 5’UTR upon SEC binding. SAXS data were collected for Tat:AFF4:P-TEFb complex in the presence and absence of TAR (Figure 3A). A comparison of SAXS data reveals significant differences in the P(r) function (Figure 3B), radius of gyration (RG), and the Porod exponent (Table 1). The RG of the TAR complex increases by 2.8 Å upon TAR binding. The Porod exponent, in contrast, is smaller for the TAR complex than the apo complex. The Porod exponent is a measure of the compactness of a molecule, with a larger exponent indicating a more compact structure. The TAR complex appears slightly less compact than the apo structure, which agrees with the differences in the shape of the P(r) function. The P(r) curve for the TAR complex is shifted to larger radii, with especially large differences in the distance distributions at r values between 70 and 130 Å.
SAXS analysis of the apo and TAR-bound Tat:AFF4:P-TEFb complexes. (A) Experimental intensities for the apo complex (left) and the TAR complex (right). Inserts in the top right corner show the Guinier plots for each data set. (B) The distance distribution plots were computed from the experimental data and normalized to the maximum value of unity. * Parameters were determined using the program SCÅTTER (Förster et al., 2010). To clearly define the interactions between TAR and Tat:P-TEFb, and to determine if direct interactions existed between TAR and AFF4, we solved the crystal structure of the TAR:Tat:SEC complex at 5.9 Å resolution (Table 2). The structure was solved by molecular replacement with one copy of the Tat:AFF4:P-TEFb complex (PDB ID 4OGR) in the asymmetric unit. After rigid-body and torsion angle molecular dynamics refinement with deformable elastic network (DEN) restraints (Table 2) (Schröder et al., 2010; Brunger et al., 2012) strong density for the TAR RNA became visible in the Fo-Fc electron density map (Figure 4—figure supplement 1) which allowed placement of one TAR molecule (PDB ID 1ARJ) into the asymmetric unit. The complex was further refined to R/Rfree = 0.211/0.311 with good geometry (Table 2) and an excellent fit to the density (Figure 4—figure supplement 2). X-ray data collection and refinement statistics for Tat:AFF4:P-TEFb with TAR21. Ribbon diagram of the crystal structure of HIV-1 TAR in complex with Tat:AFF4:P-TEFb. The top panel shows an overview of the complex with the TAR loop next to CycT1 TRM (yellow) and Tat (red), and the TAR bulge close to Tat R49, the start of the Tat ARM. Zn2+ ions are shown as grey spheres. The close-up view below highlights the interactions of the Zn2+ binding loop and CycT1 TRM with the TAR-loop and the role of AFF4 (blue) in indirectly stabilizing the Tat-CycT1 surface involved in TAR interactions. TAR nucleotides with reduced SHAPE activity (< −0.2) in the presence of SEC are colored blue, those with increased SHAPE activity (> 0.2) are colored red. The extended TAR loop region 29-33 contributes the main interactions with the SEC. It interacts with the protein complex surface composed of CycT1 TRM and the Tat cysteine-rich region, especially the Zn2+-coordinating loop (Tat 24-29). This structure rules out direct interactions between TAR and AFF4 α2. TAR loop nucleotides G32 and G33 abut the Tat Zn2+ -coordination loop (24-29) and CycT TRM, residues 259-261. The backbone phosphates of nucleotides 30–32 contact basic residues in the CycT TRM region (Figure 4). This orientation places the N-terminus of the Tat ARM (Arg49) at the widest point in the TAR major groove, which is 13 Å wide between nucleobases C24 and G34. However, there is not interpretable electron density present for residues in the Tat ARM region at the limited resolution of this crystal structure. This seems consistent with the lack of protection of this region seen in the HDX experiment (Figure 1B), but it is important not to overinterpret this observation given the limitations of the 5.9 Å map. The structure of the TAR complex with Tat:AFF4:P-TEFb shows no direct contacts between AFF4 and TAR. 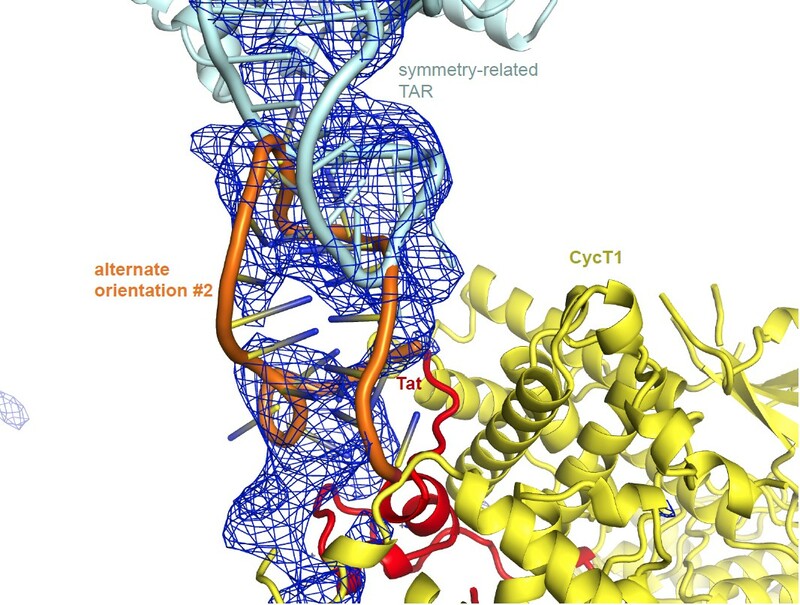 Instead, AFF4 helix α2 and its N-terminal loop connection to helix α1 are interacting with CycT1 TRM and Tat helix α1. The interaction network between these three protein regions most likely stabilizes the protein interaction surface for TAR and indirectly increases Tat:SEC affinity for TAR in the presence of AFF4 (Schulze-Gahmen et al., 2014). The Tat ARM and CycT TRM are key components for TAR binding by the SEC. Since the crystal structure shows no electron density for Tat ARM and the molecular replacement model for CycT1-TRM segment adopts multiple conformations we modeled the Tat ARM and refined the structure of the CycT1-TRM segment using the MODELLER 9.15 loop modeling protocol (Šali and Blundell, 1993; Fiser and Šali, 2003). Using hierarchical clustering and DOPE scoring (Shen and Sali, 2006) we obtained five best scoring clusters with precisions between 2.5 and 6.3 Å (Figure 5). The computed small angle scattering fits well with SAXS data obtained from the TAR complex in solution with χ=0.86 (Figure 5—figure supplement 1). The CycT1 TRM segment is anchored by CycT1 Cys261, which coordinates one of the Tat Zn2+ ions and displays structural variability in the center part of the TRM (Figure 5B). 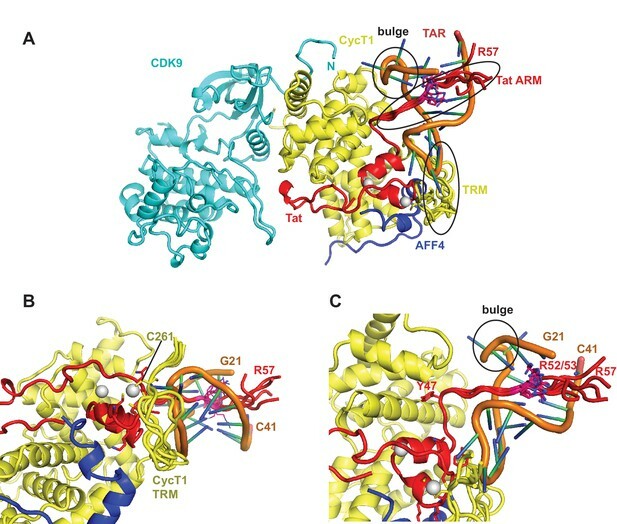 The Tat ARM region is N-terminally anchored by Tat Tyr47, which binds to a pocket on the CycT1 surface and interacts with CycT1 residues Leu44, Asp47, and Cys111 (Figure 5C). From there, the ARM (residues 49-57) extends into the major groove of TAR stretching from the TAR bulge towards the phosphate backbone opposite the bulge. Basic side chains in the Tat ARM are in positions where they can form previously described interactions with the TAR G26 nucleobase, and phosphates P22, P23, and P40 in the TAR backbone (Puglisi et al., 1993; Aboul-ela et al., 1995). Ribbon diagram of the crystal structure of the TAR-SEC complex including modeled Tat ARM and CycT1 TRM regions. (A) Overview of the whole complex with multiple conformations for ARM and TRM, using the same color coding as in Figure 4. (B) Closeup of the interactions between TAR–loop and CycT1 TRM. The complex is rotated 90 degree around x relative to (A). (C) Tat ARM is N-terminally anchored by Tat Y47 to CycT1. The extended ARM is located in the TAR major groove, positioning R52 and R53 close to the TAR bulge and TAR phosphate backbone. The strong protection of AFF4 helix α2 (residues 58-66) observed in HDX experiments could be due to direct interactions between the AFF4 helix 2 and TAR or to an indirect stabilization of the helical structure of AFF4 after TAR binding. To distinguish between these two possibilities, we explored the effect of mutations in the surface-exposed side of AFF4 helix α2 on TAR binding. We performed electrophoretic mobility shift assays (EMSA) with labeled TAR and Tat:P-TEFb complex in the presence of excess WT or mutant AFF4 fragment (residues 2-73) (Figure 6A). The single site mutants AFF4 E61A and AFF4 K63A show a three-fold and two-fold reduction in TAR binding, respectively, while the effect of the other mutations is negligible. The gel shift in the absence of AFF4 shows a 50-fold increased Kd for TAR binding by Tat:P-TEFb (Kd = 19 nM) compared to the gelshift in the presence of WT AFF4 (Kd = 0.26 nM). The small effect of surface mutations in AFF4 helix α2 on TAR binding indicates that instead of direct interactions with TAR structural stabilization of the combined interface formed collectively by Cyc T1:Tat:AFF4 (Schulze-Gahmen et al., 2014) is the major role of AFF4 α2. AFF4 mutants in helix α2 affect TAR binding. (A) Electrophoretic mobility shift assays with 32P-labeled TAR and increasing concentrations of Tat:P-TEFb in the absence or presence of excess AFF4 WT fragment (resides 2–73) or mutant AFF4 fragment. In the absence of AFF4, affinity for TAR is reduced 50-fold. Single site mutants E61A and K63A reduce TAR affinity 3 and 2-fold, respectively. (B) HeLa-based NH1 cells containing the integrated HIV-1 LTR-luciferase reporter gene were transfected with the Tat(C22G)- and/or AFF1-expressing construct as labeled. Luciferase activities were measured in cell extracts, with the level of activity detected in cells transfected with an empty vector (-) set to 1. The error bars represent ± one standard deviation from three independent measurements. To examine the AFF1/4 contribution to Tat-dependent HIV-1 transcription, we probed the effect of alanine substitutions on Tat-dependent HIV-1 transcription in HIV-1 LTR-driven luciferase expression. These assays were performed with the AFF1 scaffold protein, because Tat has a stronger effect on HIV transcription with AFF1 than with AFF4 (Lu et al., 2015). In addition, the assay used Tat(C22G), a Tat mutant that lacks an important Cys-Zn2+ ion coordination site required for wild-type Tat activity (Garber et al., 1998). It is thus highly sensitive to the AFF-mediated increase in affinity for P-TEFb (Lu et al., 2014). While wild-type AFF1 strongly supported the activation of HIV-1 LTR by Tat(C22G), all mutants displayed decreased activity, with 4-6-fold decreases observed when Glu65 (AFF4 Asp60), Glu66 (AFF4 Glu61), and Val67 (AFF4 Met62) were either singly or doubly mutated (Figure 6B). 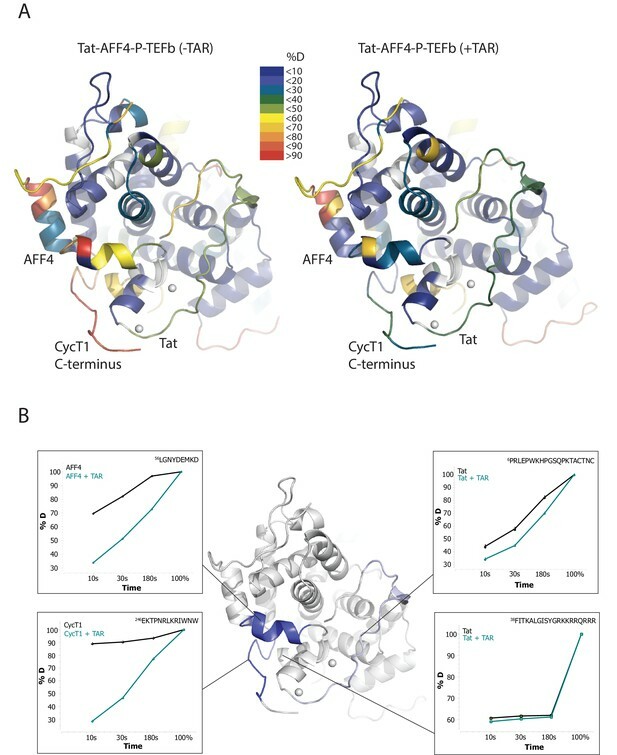 The combined results from EMSAs and transcription assays are consistent with the structural inference that AFF1/4 helix α2 plays a significant role in mediating TAR binding and Tat-transactivation, although the crystal structure shows no direct contact between them. Previous studies have identified several TAR mutations that severely reduce transactivation activity of TAR and TAR binding to a Tat-peptide spanning the ARM region of Tat (Churcher et al., 1993). Three mutants with strongly reduced transactivation activity include G21-C41→ AU, A22-U40→ UA, and U23→C, which are located just below and in the TAR bulge. To further evaluate AFF4 function in TAR binding we determined binding affinities for WT-TAR and TAR-mutants to Tat:P-TEFb with or without AFF4 (Figure 7) in electrophoretic mobility shift assays (EMSAs). In the absence of AFF4, all three TAR-mutants showed strongly reduced binding affinity compared to the WT TAR. However, in the presence of AFF4, the affinity of WT TAR was increased 50-fold to 0.2 nM, and binding of the TAR-mutants was rescued to a 2–10 fold increased KD compared to WT TAR (Figure 7). The potent rescue of bulge mutants by addition of AFF4 is consistent with the placement of the bulge distal to the Tat zinc-binding loops. The picture that emerges is of a bipartite mode of TAR binding to the SEC. Nucleobases C29-G34 interact directly with the well-ordered Tat-SEC epitope consisting of the Tat zinc-binding loops and the adjacent N-terminal portion of the CycT1 TRM. This well-ordered region is the part that is scaffolded by AFF4. The remaining nucleobases of the Tat-SEC binding site on TAR, including the bulge, interact with extended regions of the C-terminal part of the CycT1 TRM and with the Tat ARM. Effect of TAR mutations on Tat:P-TEFb binding in the absence and presence of AFF4. Electrophoretic mobility shift assays with 32P-labeled TAR were performed as in Figure 6. 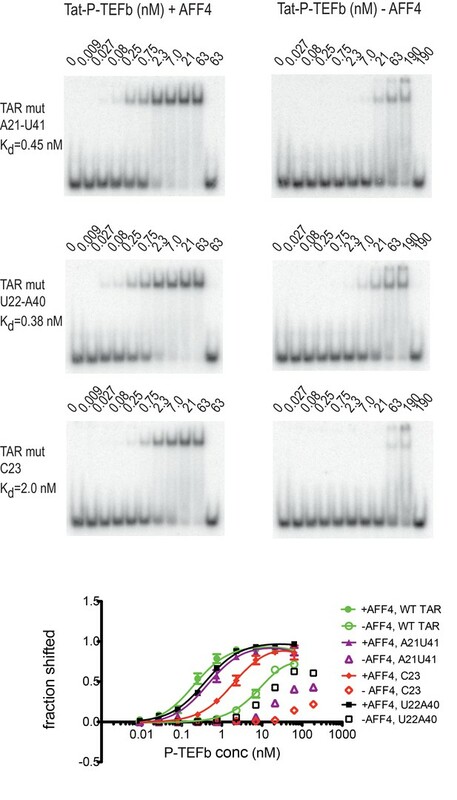 TAR mutants G21–C41→A21–U41, A22–U40 → U22–A40, and U23C (Churcher et al., 1993) show large defects in binding to Tat:P-TEFb, but can be rescued in the presence of AFF4. Experiments were performed in triplicate. The error bars represent the standard deviation from three independent measurements. Most of what we know about how HIV-1 TAR binds to HIV-1 Tat comes from some dozens of NMR structural studies of TAR in complex with argininamide or various peptide models of Tat (Aboul-ela et al., 1995; Puglisi et al., 1992; Puglisi et al., 1993; Long and Crothers 1999; Davidson et al., 2011, 2009). Tat does not function alone in HIV-infected human cells. Rather, it hijacks the host SEC, consisting of CDK9 and Cyclin T1 (P-TEFb), AFF1/AFF4, ELL1/ELL2, and ENL/AF9 (Sobhian et al., 2010; He et al., 2010; Luo et al., 2012; Lu et al., 2013). It has been known for nearly 20 years that the interaction of Tat with P-TEFb alters the specificity of its interaction with TAR. Thus a key goal in the field has been to understand the structural basis for TAR binding to Tat in the context of the SEC. Yet it has proved challenging to obtain structural data on HIV TAR in the context of the functional human Tat-SEC complex. We have now determined the first crystal structure of a TAR:Tat:SEC complex to 5.9 Å resolution (Figure 4). Despite the resolution, the maps are adequate to rule out alternative orientations of TAR. We applied a battery of biophysical studies to support and validate the low-resolution crystal structure. These data elucidate important dynamical changes, especially in AFF4, that are not evident from the crystal structure alone. The Tat ARM region was missing in the crystal structure. 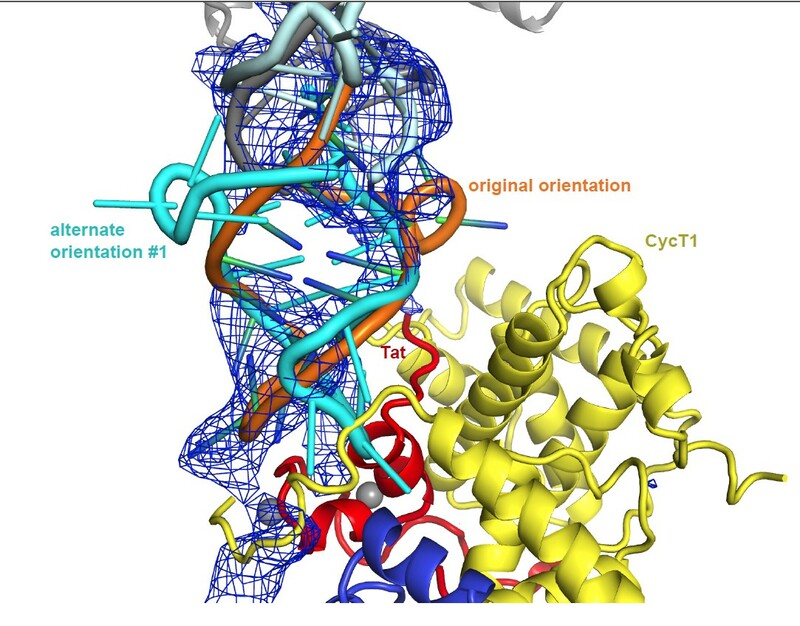 The Tat ARM, as well as the partially disordered CycT1 TRM segment, were modeled as loop ensembles inserted into the crystal structure (Figure 5). In agreement with previous biochemical data (Wei et al., 1998; Garber et al., 1998; Richter et al., 2002a, 2002b), HIV-1 TAR binds with the loop region interacting with CycT1-TRM and the Zn2+-coordinating core region of Tat, while the TAR bulge is positioned close to the expected location of Tat ARM (Figure 4, 5). Results from HDX experiments for the ARM (Figure 1) indicate a high flexibility for the Tat ARM even after binding to TAR. Indeed, the Tat peptide 38-57 exchanged 60% of its protons within 10 s, whether TAR was bound or not. This region of Tat is visualized in the crystal structure through residue 49, and the amides are protected by helical hydrogen bonds through residue 45. Thus 37% of the peptide is protected from exchange, closely matching the 40% that is involved in helical amid hydrogen bonding in the crystal structure. This supports that the ARM main-chain is extended and exposed when bound to TAR. The five best-scoring Tat ARM structures in integrative modeling are all in an extended conformation in the TAR major groove (Figure 5C), which allows the basic residues in the ARM to make contacts with bases in the TAR bulge and with the phosphate backbone. In contrast, the TAR central loop binds to a more structured protein surface, composed of the CycT1 TRM and the second Tat Zn2+ ion coordinating loop, Tat residues 24-29. Although AFF4 has no direct interactions with TAR, residues in helix α2 bolster Tat helix α2 and the Zn2+ coordinating loop, and the CycT1 TRM. This network of AFF4 interactions, which stabilizes CycT1 and Tat conformations in the TAR interacting region, is the likely cause for the 50-fold increased binding affinity of Tat:P-TEFb for TAR in the presence of AFF4 (Figure 6, 7). Consistent with the bipartite mode of binding suggested by the crystal structure and dynamics data, AFF4 is able to rescue binding of TAR mutants in the bulge and the stem region just below the bulge (Figure 7). This rescue effect is attributed to the supporting and stabilizing role of AFF4 on the TAR interacting surface composed of CycT1 TRM and Tat loop, 24-29. Our structural and binding studies show that TAR loop interactions with the CycT1-Tat core interface play a critical role for Tar binding and in the presence of AFF4 can even compensate for reduced binding between Tat ARM and TAR bulge mutants. The crystal structure is in good agreement with the results of our SHAPE experiments with HIV-1 5’UTR with or without Tat:AFF4:P-TEFb, as SHAPE-protected nucleotides C30, G32, G33, and G34, shown in blue in Figure 4B, are all in close contact with CycT1 TRM or Tat in the crystal structure. Our crystal structure of HIV-1 Tat:AFF4:P-TEFb with TAR differs significantly from the crystal structure of an equine CycT1-EIAV Tat fusion co-crystallized with EIAV TAR (Anand et al., 2008). In that structure, the Tat activation domain, which directs the incorporation of Tat into the SEC is disordered, and AFF1/4 is not present. The Tat ARM is found in a helical structure bound to the cyclin box and interacting with the EIAV TAR in the major groove and loop region. This complex structure is difficult to reconcile with the HDX data for the Tat ARM and CycT TRM, as well as with the critical role of human CycT1 residues in the TRM for TAR binding (Garber et al., 1998). This may reflect differences between EIAV and HIV-1 and/or the disorder of the Tat Zn2+ domain in this structure. While it is exciting to have a low-resolution structural view of this elusive complex, it is important to bear in mind its limitations. Side-chain conformations and details of extended main-chain segments are not defined in a 5.9 Å resolution crystal structure, nor by global information from SAXS or by the main-chain directed HDX experiment. SHAPE probes the RNA backbone reactivity, but it does not provide detailed information about the conformations of the nucleobases. This low-resolution structure provides a useful starting model until a high-resolution structure can be determined. Considerable effort has been expended over the past two decades in the design of Tat antagonists, intended to inhibit HIV-1 transcriptional elongation. This continues to be an important goal, but more attention is now focused on promoting proviral transcription to deliberately reactivate latent virus and so eradicate latent viral reservoirs. Thus, it is at least as interesting to develop Tat-TAR interaction agonists. Whether the therapeutic goal is activation or inhibition, it is important to bear in mind that Tat:TAR functions in the context of the SEC. The insight into the assembly of this complex will be helpful in pursuing either one. P-TEFb and P-TEFb-Tat1-57 were expressed in High 5 insect cells using recombinant baculovirus infections. We co-expressed human CDK9 1–330 and human cyclin T1 1–264 with and without HIV-1 Tat 1–57. Baculovirus generation and High 5 cell infections were described in detail previously (Schulze-Gahmen et al., 2013). AFF4 fragments 2–73 with a N-terminal TEV-protease-cleavable His-tag were expressed in E. coli (Schulze-Gahmen et al., 2013). 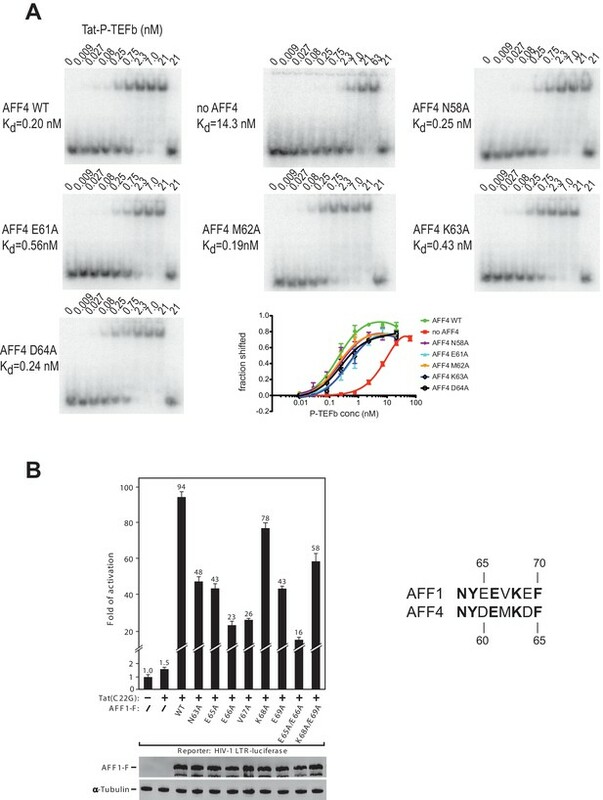 The AFF4 peptide 32-67 with acetylated and amidated termini was synthesized at the University of Utah DNA/Peptide Facility. A synthetic TAR fragment encompassing nucleotides 18–44 (TAR27) or 21–41 (TAR21) were purchased from IDT (San Diego, CA, USA). The RNA was annealed at 0.1 mg/ml in 20 mM Na HEPES pH 7.3, 100 mM KCl, 3 mM MgCl2. Best results were obtained by heating the RNA at 75°C for 2 min, followed by rapid cooling on ice. The purity of the RNA, analyzed by denaturing and native 10% polyacrylamide gel electrophoresis, was at least 95%. Tat:P-TEFb and AFF42-73 were purified separately following procedures described recently (Schulze-Gahmen et al., 2013). Tat-P-TEFb and AFF42-73 (or AFF432-67) were combined at a 1:1.4 (mol/mol) ratio, concentrated to 0.6 ml, and injected onto an analytical Superdex S200 size exclusion column equilibrated with 25 mM Na-HEPES pH 7.4, 0.2 M NaCl and 1 mM DTT. To purify the Tat:AFF4:P-TEFb complex with TAR, synthetic TAR was added in small molar excess to the protein complex prior to purification over an analytical Superdex S200 column. The center fractions of the eluted S200 peak were used for SAXS data collection. Fractions with base line absorption, collected later in the elution process, were used to measure background diffraction for the SAXS experiment. Crystals of the TAR:Tat:SEC complex grew easily under low salt conditions but diffracted very poorly. Optimization of the TAR construct used for crystallization eventually resulted in needle shaped crystals diffracting to 5.9 Å resolution. Purified Tat1-57:AFF432-67:P-TEFb was combined with the annealed TAR21 fragment, nucleotides 21-41, at a 1: 1.3 (mol/mol) ratio and concentrated to 7 mg/ml in 25 mM HEPES pH 7.3, 0.2 M NaCl, 0.05M KCl, 0.1 M Ammonium sulfate, 3 mM MgCl2, 0.5 mM TCEP. Crystals were grown in sitting drops from 0.8 ul protein-TAR complex combined with 0.5 ul reservoir solution. The drops were equilibrated against 50 mM Tris 8.5, 0.2M Ammonium Acetate, 6 mM MgCl2, 8% PEG 4K at 18°C. Single needle-shaped crystals grew to a size of about 0.05 mm x 0.05 mm x 0.25 mm. Crystals were soaked in 0.1 M HEPES pH 8.0, 50 mM NaCl, 50 mM Ammonium Acetate, 6 mM MgCl2, 15% PEG 4K, 30% glycerol for cryoprotection and flash frozen in liquid nitrogen. X-ray data were collected at Beamline 8.3.1 at the Advanced Light Source at the Lawrence Berkeley National Laboratory (MacDowell et al., 2004) using a Pilatus 3 6M detector (Dectris AG, Baden-Dättwil, Switzerland). The reflections were processed using XDS/XSCALE (Kabsch 2010) (Table 2). The Rsym for the whole data set is relatively high due to the inclusion of very weak reflections between 7.0 and 5.9 Å resolution. Based on their CC1/2 values (Karplus and Diederichs 2012), these weak reflections are contributing significant information and were included in structure refinement. 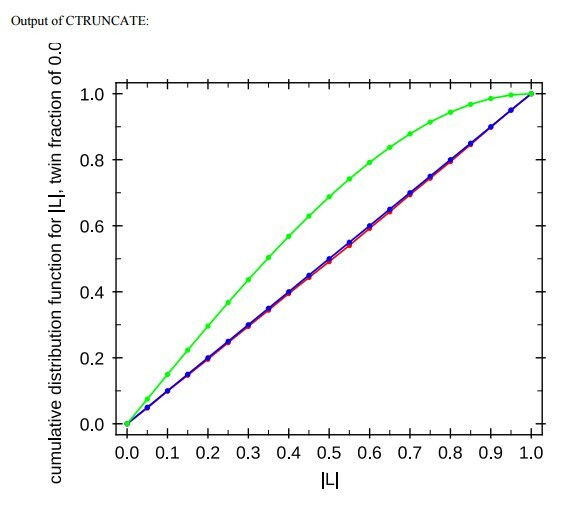 Intensities were converted to structure factors using Ctruncate (Winn et al., 2011). Data statistics calculated by Ctruncate, Xtriage, and CNS (Brunger et al., 1998) indicated no twinning (Table 2). The structure was determined by molecular replacement with PHENIX (Adams et al., 2010) using the Tat:AFF4:P-TEFb complex (PDB ID 4OGR) as the search model. Rigid body refinement in PHENIX resulted in R/Rfree = 0.36/0.394. The protein complex without TAR was further refined by torsion angle molecular dynamics with deformable elastic network (DEN) restraints γ=0.5, wDEN=100 and a slow cooling annealing protocol starting with 3000° K (Schröder et al., 2010; Brunger et al., 2012) in CNS (R/ Rfree = 0.296/0.444). Strong positive density peaks in the Fo-Fc density map (Figure 4—figure supplement 1) allowed manual placement of a TAR molecule from the NMR ensemble (PDB ID 1ARJ) (Aboul-ela et al., 1995) in Coot (Emsley and Cowtan 2004), followed by rigid-body fitting to the Fo-Fc density map using Coot. Alternative orientations of the TAR molecule were also tested but excluded based on poor electron density fits and steric clashes. Rigid body refinement in CNS after TAR placement reduced the Rfree value by 4% to 0.406. The rigid body refined TAR-complex structure was used as the reference structure in the subsequent DEN refinement. Optimal DEN refinement parameters were determined using the Grid-enabled web service for low-resolution crystal structure refinement (O’Donovan et al., 2012) (Table 2) Torsion angle molecular dynamics with these optimized DEN refinement parameters, γ=0, w wDEN=300, reduced the final R values to R/Rfree=0.223/0.31.5 at 5.9 Å resolution (Table 2). Amide hydrogen-deuterium exchange was initiated by a 20-fold dilution of Tat-AFF4-P-TEFb complex (10 µM stock) into D2O buffer containing 25 mM Na-HEPES pD 7.4, 0.2 M NaCl and 1 mM DTT at 30°C. The Tat:AFF4:P-TEFb:TAR complex was assembled by incubating Tat:AFF4:P-TEFb (10 µM) with TAR RNA (20 µM) before 20-fold dilution into D2O. After specified time intervals, the exchange was quenched at 0°C with the addition of ice-cold quench buffer (400 mM KH2PO4/H3PO4, pH 2.2). Quenched samples were injected onto an HPLC (Agilent 1100) with in-line peptic digestion and desalting. Desalted peptides were eluted and directly analyzed by an Orbitrap Discovery mass spectrometer (Thermo Scientific). 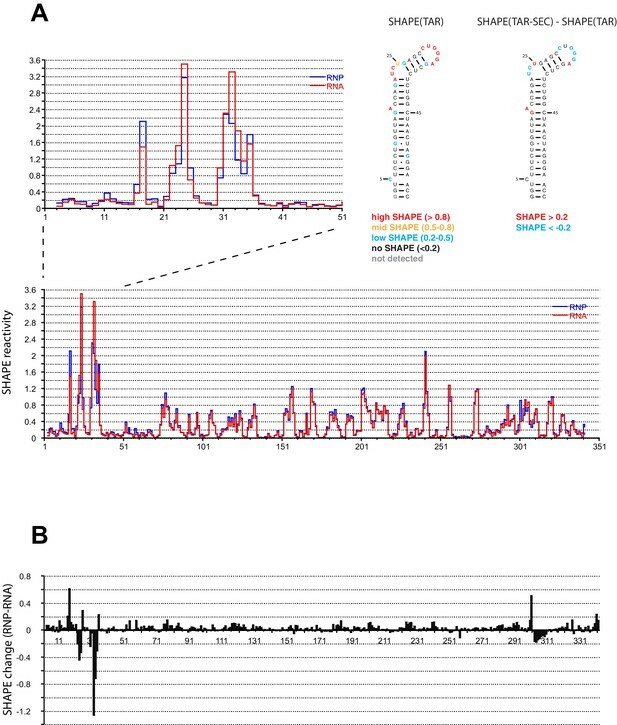 Initial peptide identification was done by running tandem MS/MS experiments. Peptides were identified using a Proteome Discoverer 2.0; Sequest HT (Thermo Scientific) search. Initial mass analysis of the peptide centroids was performed using the software HDExaminer version 1.4.3 (Sierra Analytics) followed by manual verification of every peptide. The deuteron content of the peptic peptides covering Tat, AFF4 and P-TEFb was determined from the centroid of the molecular ion isotope envelope. The deuteron content was adjusted for deuteron gain/loss during digestion and HPLC. Both nondeuterated and fully deuterated Tat:AFF4:P-TEFb complexes were analyzed. Fully deuterated samples were prepared by three cycles of drying and resolubilization in D2O and 6 M GdnHCl. The RNA construct contains the 344-nt of the HIV 5’UTR obtained from the Summers lab (Heng et al., 2012) with SHAPE handles added at both ends as previously reported (Bai et al. 2014). The RNA sample was prepared by in vitro transcription using T7 polymerase with PCR product DNA as templates, and purified using polyacrylamide gel electrophoresis. Purified RNA samples were annealed at 0.1 mg/ml in a buffer containing 50 mM K-HEPES pH 7.5, 200 mM KOAc, and 3 mM MgCl2 by heating at 75°C for 2 min and snap cooling on ice. Before SHAPE reactions, 9 μl of annealed 5’UTR RNA at 0.1 mg/mL was mixed with either 1 μL of the Tat:AFF4:P-TEFb complex to achieve a final stoichiometry of 1:1 (RNA:protein) or matching buffer containing 25 mM HEPES pH 7.3, 0.2 M NaCl, 0.05 M KCl, 3 mM MgCl2, 1 mM TCEP as a control. The resulting mixtures were incubated for 15 min at room temperature. SHAPE probing was performed as previous reported (Berry et al., 2011) with 1-methyl-7-mitroisatoic anhydride (1M7) as the 2’ hydroxyl-selective electrophile. Raw traces from fragment analysis was analyzed using ShapeFinder (Vasa et al., 2008). SAXS data were collected at the ALS beamline 12.3.1 (Lawrence Berkeley National Laboratory, Berkeley, CA) (Hura et al., 2009) at 18°C using a Pilatus 2M detector at 1.5 m sample to detector distance at a wavelength λ=1.127 Å. For each sample, 30 frames were collected with 0.5 s exposure each, and increasing numbers of buffer subtracted data frames were merged until radiation damage effects became noticeable. Sample concentrations for the Tat:AFF4:P-TEFb complex were 3.2 mg/ml, 1.6 mg/ml, and 0.8 mg/ml; those for the Tat:AFF4:P-TEFb complex with TAR were 2 mg/ml, 1 mg/ml, and 0.5 mg/ml. To reduce potential problems with sample aggregation, data were collected within 2 hr from eluting the protein complexes from a S200 size exclusion column, using only the center peak fractions. Buffer-subtracted datasets were merged and analyzed using the program SCÅTTER (Förster et al., 2010). The Dmax was determined after optimizing the P(r) function using the program SCÅTTER, following recommended procedures. The initial P(r) function was calculated with the default Dmax of 96 Å. After removing the very low resolution data in the Guinier region, Dmax was increased until the P(r) function showed no undulations and was positive for all r-values. Comparison of the data collected at two-fold different concentrations showed some scattering effects due to intermolecular interactions at higher protein concentrations (Figure 3). To reduce these effects, we used data collected at the lowest protein concentration for the apo complex. For the TAR complex, we merged the data from the low and high protein concentrations by scaling and merging the middle section of the curves and retaining the data from the lower and higher concentration only for the low and high-resolution data, respectively. The fit of the computed SAXS profile and χ value of the crystal structure to the experimental SAXS data was calculated using the program FoXS (Schneidman-Duhovny et al., 2013, 2010). Tat ARM and CycT1 TRM are disordered protein segments that are key for TAR binding to the Tat:AFF4:P-TEFb complex. These two regions are not well defined in the crystal structure. We used the MODELLER 9.15 loop modeling protocol (Šali and Blundell, 1993; Fiser and Šali, 2003) to build the missing residues of the Tat ARM segment and to refine the conformation of the CycT1 TRM segment. We added a soft upper bound of 5.2 Å on the distance between Tat residues R52 and R53 and the TAR backbone, based on an NMR spectroscopy study (Calnan et al., 1991; Puglisi et al., 1993). We constructed 5000 loop models for the Tat ARM and CycT1 TRM segments, followed by hierarchical clustering based on pairwise all-atom RMSD values. We selected the top 5 best scoring clusters based on the DOPE assessment score (Shen and Sali, 2006). For each cluster, we used the centroid structure as the representative structure for further analysis. The precision of selected clusters ranges between 2.5 and 6.3 Å. Prior to obtaining the crystal structure of the TAR-SEC we determined an integrative structure of the complex using HDX, SAXS, and SHAPE data, as well as structural information for the individual components of the TAR complex with Tat:AFF4:P-TEFb. This integrative structure had errors due to incorrect filtering criteria. Before the X-ray structure of Tat:AFF4:P-TEFb:TAR complex was determined, we modeled the complex by integrative structure modeling (Alber et al., 2007; Russel et al., 2012; Schneidman-Duhovny et al., 2012, 2014). Integrative modeling was based on the atomic structure of the Tat:AFF4:P-TEFb complex (PDB ID 4OGR) (Schulze-Gahmen et al., 2014), an atomic structure of TAR (Schneidman-Duhovny et al., 2010, 2013) (PDB ID 1ARJ and 2KX5), a small-angle X-ray scattering (SAXS) profile of the complex, difference HDX data for the apo and TAR complexes, the SHAPE data describing the interactions between the HIV-1 5’UTR and the Tat-AFF4-P-TEFb complex, and previously published biochemical data identifying key residues for the recognition of TAR, including a cross-link between TAR U31 and CycT1 252-261 (Garber et al., 1998; Richter et al., 2002b). Specifically, we followed an integrative docking protocol (Schneidman-Duhovny et al., 2012), using the rigid-body docking program PatchDock (Schneidman-Duhovny et al., 2005). We selected only those resulting models whose FoXS computed SAXS profile (Schneidman-Duhovny et al., 2013, 2010) matched the experimental profile with χ < 1.5, followed by hierarchical clustering based on the pairwise all-atom RMSD values. Next, we filtered the remaining representative models further based on the HDX data, requiring that the Solvent Accessible Solvent Area (SASA) of AFF4 residues 57 to 67 was reduced by at least a 10% upon TAR binding. However, in retrospect, this filtering criterion was too strict, resulting in elimination of the correct model of the Tat:AFF4:P-TEFb:TAR complex. The crystal structure revealed that changes in the HDX rates of the AFF4 helical region are in fact caused by a conformational change triggered by binding of TAR rather than direct binding of TAR. The example illustrates the need for a conservative interpretation of experimental data used for structural modeling. It is more prudent to err on the side of caution, and apply spatial restraints that are broader than narrower, resulting in a less precise ensemble of models that still contains the correct structure as opposed to a more precise ensemble that does not contain the correct structure. The HeLa-based NH1 cell line containing an integrated HIV-1 LTR-luciferase reporter plasmid (He et al., 2010) was transfected with constructs expressing Tat(C22G) only or together with the indicated AFF1 proteins. 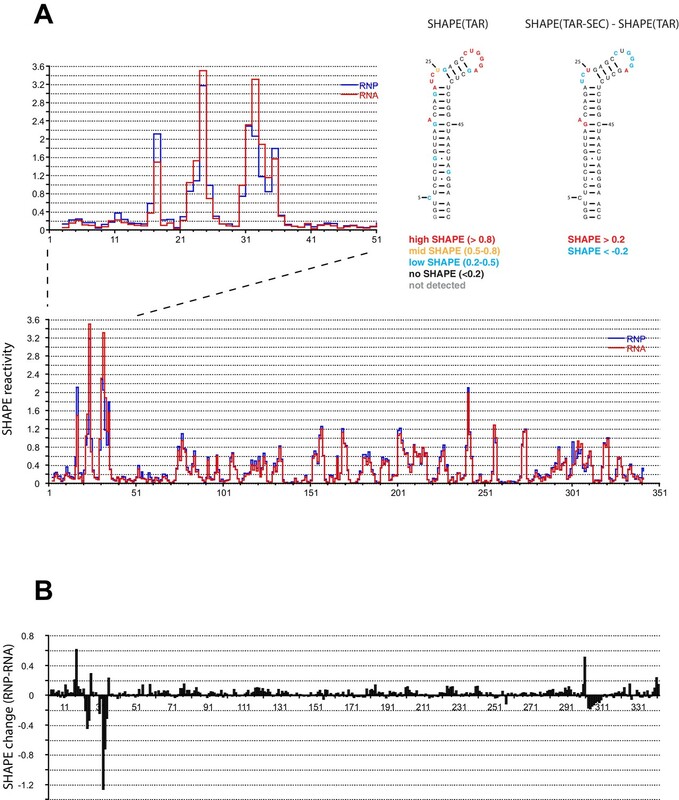 AFF1 mutants were chosen based on their surface exposed position on the second αhelix in the homologous AFF4 (Schulze-Gahmen et al., 2014), with the exception of Val 67, which is only partially exposed. At 48 hr post transfection, total cell lysates were prepared and luciferase activity was measured with kit E1501 from Promega (Madison, WI, USA). An aliquot of cell lysates was analyzed by western blotting with the indicated antibodies to detect the level of the transfected AFF1 protein and the endogenous α-Tubulin. Journal of Molecular Biology 253:313–332. Nature Structural & Molecular Biology 15:1287–1292. Journal of Molecular Biology 230:90–110. Journal of Applied Crystallography 43:639–646. Journal of Molecular Biology 417:224–239. Annual Review of Biophysics and Biomolecular Structure 32:1–25. Molecular and Cellular Biology 32:2608–2617. Journal of Synchrotron Radiation 11:447–455. Journal of the American Chemical Society 134:6617–6624. Journal of the American Chemical Society 127:4223–4231. Acta Crystallographica Section D Biological Crystallography 68:261–267. Current Opinion in Structural Biology 28:96–104. RNA recognition by Tat-derived peptides: interaction in the major groove? Journal of Biological Chemistry 275:34314–34319. Thank you for submitting your article "Insights into HIV-1 proviral transcription from an integrative structure of the P-TEFb:AFF4:Tat:TAR complex" for consideration by eLife. Your article has been reviewed by Jonathan Karn (Reviewer #1), James R Williamson (Reviewer #2), and Wes Sundquist, who is a member of our Board of Reviewing Editors, and the evaluation has been overseen Richard Aldrich as the Senior Editor. 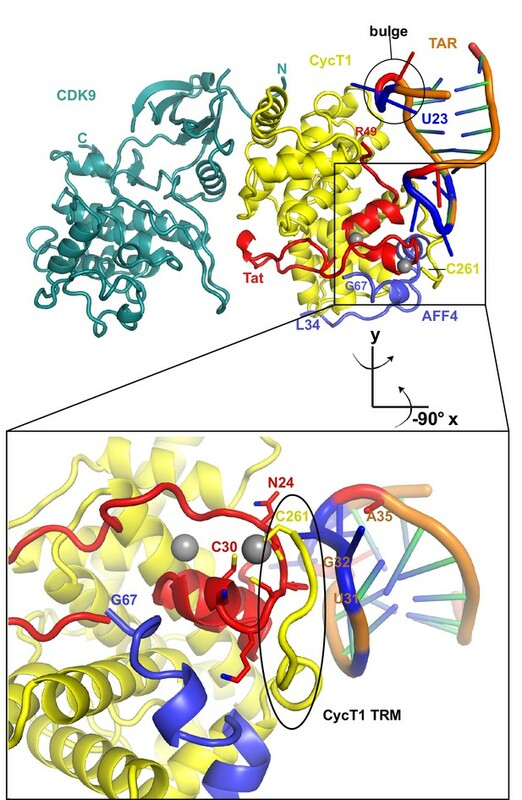 Building on their earlier X-ray structure of the Tat:AFF4:P-TEFb complex (with the late Dr. Tom Alber), the authors have built experimentally constrained models of Tat:AFF4:P-TEFb in complex with the HIV TAR hairpin. The final ensemble of structures was deduced through a well-validated computational integrative modeling approach that combines SAXS, HDX-MS, and SHAPE data generated in the current study, together with previously published data from NMR studies of TAR in complex with Tat peptides or argininamide, biochemical cross-linking data, and X-ray structures Tat:P-TEFb and the super elongation complex (SEC). – Residues on the C-terminal segment of the N-terminal Tat and Cyclin T1 interacting region of AFF4 form (apparent) direct contacts with TAR UCU bulge. – The Tat ARM fits into the TAR major groove with Tat R52 and R53 formingelectrostatic interactions with the TAR UCU bulge. HDX-MS studies suggested that Tat-TAR interactions in the context of SEC are mediated primarily by amino acid side chains. – Cyclin T1 TRM, previously shown to directly interact with and to be ordered by AFF4, binds TAR in a region spanning the bulge and apical loop. – Confirmation that the cysteine-rich and hydrophobic core regions of Tat contribute to binding TAR. Experimental support for the functional interactions of the AFF1/4 scaffold with TAR stems from TAR binding and HIV LTR-luciferase reporter gene assays support the structural findings. Overall, this is a well-written manuscript provides an insightful addition to long-standing questions about how TAR RNA is recognized and Tat is delivered to the transcriptional machinery. This work will eventually be superseded by X-ray structures of the complex, but it is impossible to anticipate when such structures will become available, and in the meantime, these models provide the best framework available for studying these interactions. Although SHAPE revealed changes to the A22-U25 bulge as well as the C30-A35 loop region, specific sites of contact on TAR as well as any RNA conformational changes due to SEC binding could not be defined. Moreover, mutations in putative contact residues from AFF1/4 had only modest effects on binding (see below). Previous studies have shown a range of phenotypic effects of point mutations in the UCU bulge and apical loop, as well as transversions base pairs in the TAR stem-loop structure. It would greatly strengthen the argument for direct interactions between AFF1/4 and TAR RNA if mutations in these regions could be shown to selectively limit AFF4 complex binding. If this proves not to be case, then the authors should reconsider their hypothesis that AFF1/4 interacts directly with TAR. 1) While it is unquestionable from the authors' study that AFF4 robustly increases the affinity of Tat:P-TEFb for TAR, the molecular mechanisms are yet to be properly defined. Point mutations of N-terminal residues on AFF4 that are presumed to be directly involved in TAR binding only elicited a small reduction (>4-fold) in SEC binding to TAR. It is therefore somewhat unclear the extent to which direct AFF4-TAR interactions contribute to the robust strengthening of Tat:P-TEFb binding to TAR. The Results section suggests that the role of direct contacts is secondary to a scaffolding role, but the discussion seems to place a larger importance on the complex formation role of helix α2 of AFF1/4 than the data suggest. Moreover, the authors should at least mention alternative possible explanations, including that they may not have mutated the key contact residues and/or that AFF1/4 may not, in fact, contact TAR directly (i.e., that the modest mutational effects reflect indirect effects). 2) Were replicates performed on the biochemical experiments? 3) While the authors discuss briefly the surprising result that Tat peptides showed little delay in D-exchange, it is unclear how reconcile their reasoning (Results paragraph three) with previously published NMR results showing direct hydrogen bonding (Puglisi et al. 1992). 4) It would be helpful to include a control trace of RT reactions with TAR RNAs in the absence of SHAPE reagents so the reader can assess the presence of natural strong stops which might affect the data analysis (as SI). The data presented are differences, and it is not possible to see positions about which there is no real information. 5) For the SHAPE differences alluded to in subsection “SHAPE mapping of the Tat:AFF4:P-TEFb complex on the HIV 5’UTR”: Were the differences different patterns, or different degree of protection? 6) Please describe how the Dmax was calculated in SAXS distance distribution plots in the Materials and methods. 7) In the Introduction, it is claimed that more accurate and more precise structures are obtain. This seems unjustified. They are probably more precise, using all information available, but how can better accuracy be claimed, in the absence of independent validation? 8) Introduction: "first experimental structure, albeit at low resolution". Not to quibble, but this language is not precise and does not accurately reflect what was done. The results from this effort are a hybrid model. Some parts of the model are at atomic resolution, and others are relatively unconstrained. "Low resolution structure" doesn't seem quite the right way to describe this. The spirit of the hybrid modeling is very much akin to NMR structure determination, where one never describes the resolution, but rather the RMSD of independent trials. Along these lines, it might be helpful to show superpositions of the resulting models where the alignment is done on only part of the structure (say CycT1:Cdk9), showing the variance of the other regions (as is done for two-domain protein NMR structures for example). This language is also used in the second to last paragraph of the Discussion. 9) Subsection “Integrative modeling of TAR binding to the Tat:AFF4:P-TEFb complex”, second paragraph: 1ARJ is the Abou-ela 1996 structure. 10) If indeed AFF4 causes a 70-fold enhancement in SEC affinity for TAR, why is this not reflected in a HIV transcriptional assay using wildtype Tat? Why did the authors select C22G Tat which would be defective for both P-TEFb and TAR binding based on their structural analysis? Thank you for resubmitting your work entitled "Insights into HIV-1 proviral transcription from the structure and dynamics of the Tat:AFF4:P-TEFb:TAR complex" for further consideration at eLife. Your revised article has been evaluated by Richard Aldrich as the Senior Editor, a Reviewing editor, and a reviewer. Since your resubmitted work now includes an X-ray crystal structure, we decided to switch the Reviewing Editor and also consult another reviewer, both with expertise in X-ray crystallography. While it is gratifying that the authors replaced their previous integrative model with a model based on a crystal structure, there are concerns about this new low-resolution crystal structure. From Table 2 and Figure 4—figure supplement 1, it is difficult to judge if the density shown in Figure 4—figure supplement 1 uniquely determines the proposed position of the RNA. While there is difference electron density at 2σ in this region, how confident are the authors that this is the only possible fit? For example, the model might be positioned backward? The absence of density of the TAT ARM region is worrisome. The model that the authors propose for the TAT ARM region (Figure 5) suggests multiple contacts between the TAT ARM region and the rest of the complex, so it is surprising that there would be no electron density for it. As the authors point out, their model of the ARM region differs considerably from that seen in the crystal structure of CycT1-EIAV Tat - EIAV TAR (Anand et al. 2008). Of course, these could be real differences, but the Anand et al. structure is more definitive (at 3.15 Å resolution) compared to the low-resolution model by presented in this work. We do not find the possible explanations given for the differences in structures to be reassuring. Table 2 indicates a number of possible issues with this crystal structure (low CC1/2 and very high Rmerge in the highest resolution shell, high Rfree-Rdifference, poor Ramachandran geometry). Although such poor quality indicators may not necessarily indicate incorrectness of the atomic model, they add to the uncertainty of this low-resolution structure. The authors may have chosen the non-optimal mutations to validate the structure. They mutated individual residues on the exposed surface of AFF4 helix 2 and showed that they had only a small impact on Kd be gel shift (one of them had a two-fold effect and another had a 3-fold effect others had no effect). In comparison, complete omission of AFF4 had a 50-fold effect. The concern is that single Ala point mutations are as gentle as one could get, and might quite reasonably have a very modest effect on a direct binding interaction that overlaps this surface compared to complete omission. At the very least, the authors should have made mutations that were trying to falsify the hypothesis - such as radically different substitutions at multiple residues. In the section "Modeling of Tat ARM and CycT1 TRM", the claim that SAXS data are consistent with the structure is underwhelming. The real question is, what structure would not be consistent with the SAXS data. For example, can they show that the EIAV structure is incompatible with the SAXS data? In summary, this work could greatly benefit from improved crystals, improved diffraction data collection, and improved atomic model refinement. Improved data and model qualities would lend more confidence into the insights gleaned from this complex. Thus, authors are asked to make a good effort to collect improved diffraction data and to obtain a better atomic model. It is likely that the authors could improve the diffraction quality by optimization of the purification of the complex, crystallization and freezing conditions. Moreover, data collection at a microfocus beamline may improve the limiting resolution of the data. Thank you for resubmitting your article "Insights into HIV-1 proviral transcription from integrative structure and dynamics of the Tat:AFF4:P-TEFb:TAR complex" for consideration by eLife. Your article has been reviewed by a Reviewing Editor and Richard Aldrich as the Senior Editor. We thank the authors for the revision and responses to our concerns. We first would like to clarify that we did not request an "atomic" resolution structure. Rather, we stated that "this work could greatly benefit from improved crystals, improved diffraction data collection, and improved atomic model refinement. Improved data and model qualities would lend more confidence into the insights gleaned from this complex." We of course realize the difficulties in obtaining well-diffracting crystals, but we remain concerned about some of the properties of the diffraction data and associated atomic model. To this end, we examined the PDB validation report that the authors kindly provided. First, according to the report, the geometry is not "good" contrary to what is stated in the Results section of the manuscript. We realize that it is difficult to build a model with good geometry at such low resolution, so this may explain the poor geometry. Moreover, there are some curious abnormalities, for example, the large differences between observed and ideal C=O bond lengths. It is actually extremely important that a model refined against low-resolution data has perfect geometry since the information content of the diffraction data is so low. The authors are incorrect to state that poor geometry at low resolution "is the accepted wisdom in protein crystallography". The PDB validation report also reveals that four out of five chains that have a rather poor fit to the electron density. Moreover, the report indicates that the diffraction data suffer from a substantial twinning fraction and L-test statistical values that suggest twinning. It is likely that if the crystals were in fact twinned, it might explain the poor fit with electron density as reported by the PDB validation report, the poor fit of TAR into the difference electron density (Figure 4—figure supplement 1), and the absence of density of the Tat ARM. The presence of a substantial twin fraction makes the interpretation of difference maps notoriously difficult due to the inherent introduction of noise by twinning. Moreover, models derived from twinned diffraction data are much more prone to potential model bias than for data without twinning. In relation to this issue, the absence of electron density does not necessarily imply that the particular part of the complex is "flexible", but it may be a consequence of twinning. Thus, the conclusions drawn from this structure for the position and conformation of TAR and the Tat ARM must be viewed with great caution. The authors argue that their work is not entirely based on the low-resolution crystal structure, and they integrated data from a number of sources to obtain a more complete model. However, we are concerned that this integrated modeling approach did not produce the "correct" structure in the absence of the low-resolution crystal structure, although, according to a previous rebuttal by the authors, it is apparently within a large ensemble structures that was predicted (however, the authors did not provide the entire ensemble). In any case, the crystal structure apparently played a pivotal role to determine then "correct" structure, and therefore must undergo the type of scrutiny that is appropriate for any important crystal structure. Considering the importance of the crystal structure, the authors are requested to improve the diffraction data and the associated model. Please note that we do not necessarily request higher resolution, but we would ideally like to see a higher quality diffraction data set without twinning, and associated model at the resolution that is claimed here. […] Overall, this is a well-written manuscript provides an insightful addition to long-standing questions about how TAR RNA is recognized and Tat is delivered to the transcriptional machinery. This work will eventually be superseded by X-ray structures of the complex, but it is impossible to anticipate when such structures will become available, and in the meantime, these models provide the best framework available for studying these interactions. We appreciate these comments and note that an x-ray structure (admittedly at just 5.9 Å resolution) has now been determined and added to the manuscript. Despite the limited resolution, the new x-ray structure adds enormously to the confidence level in the RNA positioning, and leads a model that is consistent with the rest of the data. The suggested mutations were made. See the new Results subsection “Effects of TAR Mutants on SEC Binding”. They were found to be more permissive for AFF4 binding, the opposite of the prediction from the integrative model. In parallel with these studies, we redoubled efforts to determine the crystal structure of the complex. This was successful, and we now report the crystal structure at 5.9 Å resolution. The structure shows that there are no direct contacts between AFF4 and TAR. AFF4 acts by stabilizing contacts with the TAR central loop, not the bulge, consistent with the effects of the bulge mutants. The integrative model has been removed from the manuscript and replaced with the crystal structure. We wish to note that the family of models generated in the course of integrative modeling included the correct model. This model was filtered out based on what we now know to be an incorrect criterion that direct contacts be made with AFF4. It is somewhat unusual for such strong protection to be seen for regions that do not make direct contacts. It is tempting to infer that binding sites correspond to regions of high protection since this is often the case. This episode should serve as a caution in the interpretation of HDX protection data in terms of direct vs. indirect binding. A new supplementary text section has been added that describes lessons learned. The new data show that the contribution of AFF4 is large but entirely indirect. Yes. Luciferase experiments were repeated 3 times. Gel shift assays were repeated 3 times (2 times in a few cases). We have gone back to this 1992 manuscript and have found no mention of hydrogen bonds between RNA and main-chain backbone amides. The interactions with arginine side-chain would not be expected to have any effect on the exchange of amide protons. Please see the new Figure 2—figure supplement 1. Comparison of our Figure 2 and the reference shows differences in pattern and in degree of protection. This is now described in the “SAXS” sub-section in the Material and Methods. 7) In the Introduction it is claimed that more accurate and more precise structures are obtain. This seems unjustified. They are probably more precise, using all information available, but how can better accuracy be claimed, in the absence of independent validation? The word “accurate” was removed, along with the rest of the integrative modeling. In hindsight this word was a particular poor choice, as described in detail in the new supplementary text section. The integrative model was replaced with a crystal structure, whose resolution at 5.9 Å is, we believe, indisputably “low” by crystallographic standards. Thank you for spotting this mistake. It has been corrected. The reason we used the C22G mutant Tat, which lacks an essential Cys-zinc bridge required for proper folding, is because it is highly sensitive to the AFF-mediated stimulation in the transcription assay. We currently don’t know why WT Tat is far less sensitive in this assay. It is possible that in all the in vivo Tat-transactivation assays we have performed so far, it always involved the introduction of additional AFF1/4 into the cells or knocking down but not completely depleting AFF1/4 from the system. These situations may have made WT Tat, which is incredibly powerful, less sensitive to the stimulatory effect of AFF4 compared to that detected under the highly reductionist gel-shift conditions. We have recently performed a TAR pulldown assay looking for proteins that bind to TAR under Tat (+) and (-) conditions and saw significantly more Tat-mediated loading of the SEC subunits when HeLa nuclear extract (NE) was incubated with TAR RNA. However, when NE prepared from the AFF4-KD cells (~80% KD efficiency) was used in the assay, there was no obvious difference in loading of the rest of the SEC components to TAR. This illustrates that the stimulatory effect of AFF4 is not so easy to detect when analyzed under more complicated situations where there are still some leftover AFF1/4 in the cells. The TAR orientation is uniquely defined by the difference density. We are including additional figures for 2 alternate TAR orientations. Alternate orientation #1: Author response image 1 shows the density and packing for a TAR rotation, which exchanges the 5’ and 3’ termini of the TAR molecule. The TAR loop in this alternate conformation doesn’t fit the density well, and it clashes with Tat as well as with CycT. In addition, Tat G48, which marks the start of Tat ARM, is positioned next to the minor groove of TAR. This contradicts multiple reports showing Tat ARM interactions with the TAR major groove. Finally, in the orientation described in the manuscript the TAR loop runs parallel to the CycT1 TRM, potentially making contacts over an extended TRM residue range, as would be expected from biochemical data presented in Garber et al 1998. This is not true for the alternate orientation where the TAR loop intersects the CycT TRM in an almost perpendicular orientation. Alternate orientation #2: Author response image 2 shows an alternate orientation with the TAR loop placed where the TAR ends were before, and vice versa. Again, the fit with the electron density is worse, and there are severe steric clashes in the crystal packing between the TAR loops. This orientation also would not agree with any of the published biochemical data nor with the SHAPE data in our paper. Only the orientation described in the manuscript results in good packing and good fit with the density. In summary, the orientation of TAR is defined by the unbiased crystallographic difference density beyond doubt. We added a statement to this effect to the Discussion. The crystallographic structure is fully consistent with the SHAPE data and the sum of the extensive biological data, and alternative 1 and 2 are not. Unbiased difference electron density contoured at 2.4 sigma. Unbiased difference electron density contoured at 2.3 sigma. The HDX data address this important question. Figure 1B shows that the Tat peptide 38-57 is 60% H-D exchanged within 10 s, regardless of whether TAR is bound or not. This region of Tat is visualized in the crystal structure (4OGR) through residue 49, and the amides are protected in an helical hydrogen bonds through residue 45. Thus 37% of the peptide is protected from exchange and that matches well with the 40% that is involved in helical amid hydrogen bonding in the crystal structure. This provide strong evidence that the rest of the Tat peptide (46-57, including the ARM) is not involved in hydrogen bonding that would protect that amides from exchange. This essentially rules out the adoption of a helical structure. The absence of protection in this region is most consistent with the ensemble model shown in Figure 5. Wording to this effect has been added to the Discussion. As the authors point out, their model of the ARM region differs considerably from that seen in the crystal structure of CycT1-EIAV Tat - EIAV TAR (Anand et al., 2008). Of course, these could be real differences, but the Anand et al. structure is more definitive (at 3.15 Å resolution) compared to the low-resolution model by presented in this work. We do not find the possible explanations given for the differences in structures to be reassuring. Anand et al. fused the N-terminus of Tat fused to the C-terminus of the TRM of cycT1. This proved to be an unfortunate choice in retrospect. Subsequent structures of the Tat from the Alber and Tahirov labs (4OGR, 3MI9) showed that the N-terminus is buried in a polar core mostly formed by T1 by also by part of Tat itself. Fusions to the N-terminus will thus disrupt the complex. In the Anand structures of Cyclin T1-Tat (Tat disordered) (2PK2) and Cyclin T1-Tat (Tat core is disordered)-EIAV TAR (2W2H), the T1 TRM occupies the position that was subsequently shown by Tahirov (3MI9) to actually be occupied by the Tat core. Thus it is now clear that the N-terminal fusion of cycT1 to Tat causes the core of Tat to misfold. The region of space that would have been occupied by the Tat core is vacated by Tat and cycT1 TRM moves into this region, causing it to occupy a non-productive conformation. These structural distortions are consistent with the extremely weak binding of the cycT1- Tat fusion to TAR: at 2 µM TAR, half maximal binding is seen with ~ 3.5 µM fusion construct (Figure 4, Anand, et al. JMB 2007). Compare this to 19 nM for the native PTEFb:Tat complex, a nearly 200-fold loss. Beyond the concern raised by the massive loss of affinity, there were no new mutational studies of the protein contacts were carried out in the Anand study. In other words, the putative protein-RNA contacts in the Anand paper have never been validated. 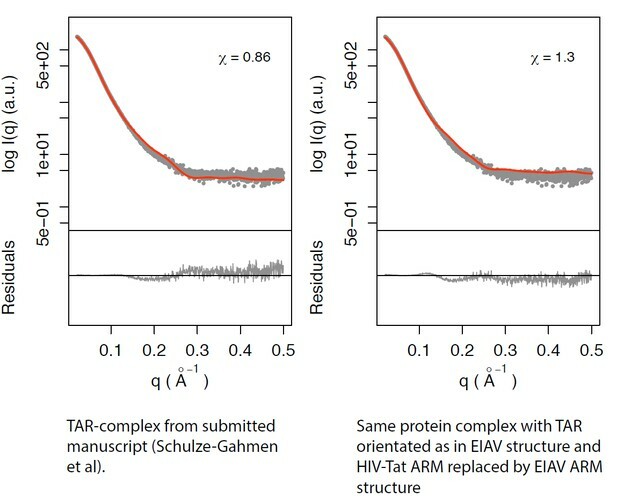 The working consensus in the field seems to be that the EIAV structure is an artifact of the use of a fusion construct that was never demonstrated to be functional, and indeed, actually has a severe loss of RNA binding function. At best, the structure is irrelevant to the situation with HIV-1. The round of P-TEFb structural papers by Schulze-Gahmen et al eLife 2013 and Gu et al. Cell Cycle 2014, building on Tahirov 2010, do not cite the Anand papers. In the overall quality analysis of the structure from the PDB-validation server, our structure is in the 40-50th percentile rank for Rfree, Clashscore, and Ramachandran outliers when compared to other 8.00-3.65 Å structures. Since this is a wide resolution bracket with more structures at the higher resolution end than at the low resolution limit and 5.9 Å is more towards the lower end, these percentile scores seem perfectly acceptable. The CC1/2 value of 0.24 in the high resolution bin corresponds to a true CC (CC*) value of 0.62, which is excellent and is above the cut-off used in the analysis of Karplus & Diederichs, Science 336: 1030-1033, 2012. CC* rather than Rmerge is currently considered the gold standard in determining data cut-offs. Karplus and Diedrichs stated that “it is justified to include data out to well beyond currently employed cutoff criteria, because the data at these lower signal levels do not degrade the model, but actually improve it.” It is fair to say that this view is the current accepted wisdom in protein crystallography. It was shown in previous work that AFF4 helix α2 residues M62 and F65 are important for interactions with Tat (Schulze-Gahmen et al., eLIFE, 2014), with the single Ala mutants of their AFF1 cognates reducing transactivation 4-6 fold (and a more substantial ~15 fold for the double mutant). These are very significant effects and they are completely consistent with our current model. The exposed surface of AFF4 mutated in this study was really the last remaining face of the helix that had not already been probed. Our initial integrative model, built without crystallographic data, had a χ =1.4 and eventually proved to be wrong. Similarly, a model composed of human AFF4-P-TEFb with a chimeric HIV/EIAV-Tat (HIV-Tat 1-48, EIAV-Tat 49-57) and HIV-1 TAR positioned as in the Arnon et al structure (pdb 2W2H) resulted in χ =1.3 (Author response image 3). Our current model based on crystallographic data, HDX, SHAPE, and SAXS data has a χ value of 0.86, significantly lower than either of the above-mentioned models. The SAXS data taken alone are not proof of the correctness of the model, and we make no claim that they are. They are, as we state, consistent with the model. The SAXS data are substantially more consistent with the current model than with any of the alternatives tested, with a χ < 1, while the alternatives have χ > 1. Left panel: TAR-complex from the manuscript (Schulze-Gahmen et al; Figure 5—figure supplement 1). 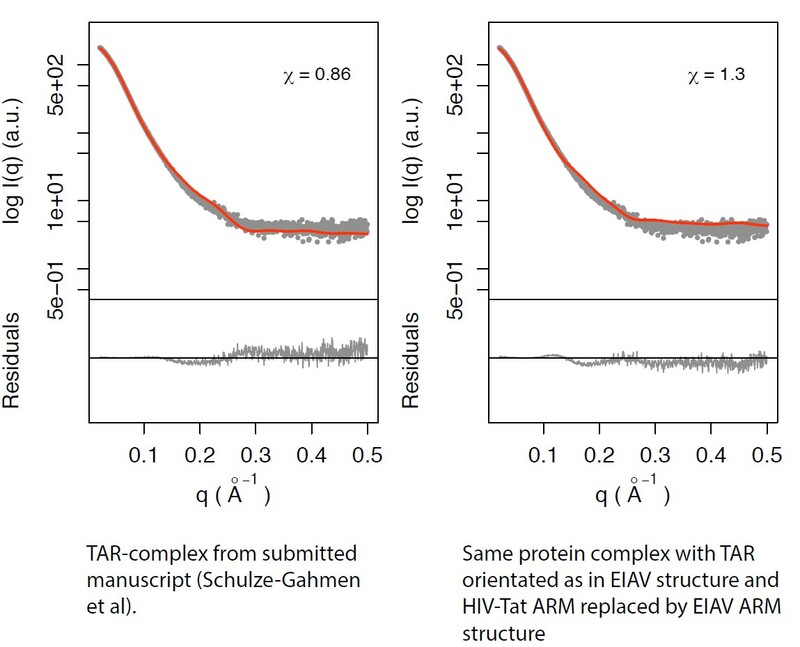 Right panel: Same protein complex with TAR orientated as in EIAV structure and HIV-Tat ARM replaced by EIAV ARM structure. We have re-inserted the word “integrative” into the title to highlight that are conclusions are based on the totality of the data. The last sentence of the Abstract has been modified to emphasize that the conclusions are drawn from the totality of the data as processed by integrative modeling, such that the conclusions are not based solely on the crystallography or on any other single technique. The Impact Statement has also been modified to highlight this key point. We would rather not think of this as a low-resolution crystallography paper; our intent was to put together an integrative modeling paper that now goes above and beyond the norm by providing a crystal structure as part of the input data. The biological problem addressed here is so significant that the original referees and BRE member favorably reviewed the level of insight even at the original low resolution. In order to build confidence in the model, we have now added an intermediate (in a global sense) resolution crystal structure. Since there was already a consensus that even the low-resolution insights were an important advance for the field, it does not seem reasonable raise the bar two notches (from low to intermediate, and then from intermediate to atomic) at the time of the second revision. We make no conclusions that cannot be defended with the available data at the current resolution. In sum, the conclusions are highly significant to the field as judged by a consensus of the original reviewers and editor, and the conclusions are fully supported by the intermediate resolution data provided. As a practical matter, crystals of the P-TEFb:AFF4:Tat:TAR complex were first obtained two years ago and optimization has been slow and painstaking. Data have been collected on a variety of beamlines. While it is impossible to forecast progress precisely, on the basis of past experience our best estimate is that it will take another two years to obtain an atomic model. […] We thank the authors for the revision and responses to our concerns. We first would like to clarify that we did not request an "atomic" resolution structure. Rather, we stated that "this work could greatly benefit from improved crystals, improved diffraction data collection, and improved atomic model refinement. Improved data and model qualities would lend more confidence into the insights gleaned from this complex." As a general comment, we realize that there were items in the PDB validation report that could be flagged by a diligent reviewer. Yet we also note that the PDB validation server was not designed with the special situation of low resolution structures in mind. The method used by this server to detect twinning is not robust at low resolution, and the electron density fits used the automated map calculation does not used the low resolution-optimized scaling procedure from the CNS DEN method that we followed. As we document below, our structure is in all respects up to par for a 5.9 Å structure composed of substructures that had been individually well-refined against high resolution diffraction or NMR data. We of course realize the difficulties in obtaining well-diffracting crystals, but we remain concerned about some of the properties of the diffraction data and associated atomic model. To this end, we examined the PDB validation report that the authors kindly provided. First, according to the report, the geometry is not "good" contrary to what is stated in the Results section of the manuscript. We realize that it is difficult to build a model with good geometry at such low resolution, so this may explain the poor geometry. There was no manual model building involved in our study other than rigid-body docking of an RNA conformer from 1ARJ into density. Refinement was done using the DEN algorithm in CNS with tight coupling of our structure to the reference structure, which avoids over-fitting, as documented by the reasonable free R-factor. Apart from protein-RNA contacts, and the CO bond length addressed below, the model quality is essentially that of the parent structures, which were determined at high resolution (protein) and by solution NMR (RNA). Moreover, there are some curious abnormalities, for example, the large differences between observed and ideal C=O bond lengths. has been corrected and the PDB deposition replaced. There is no impact on any other aspect of the structure, maps, R-factor, or interpretation. A new validation report is attached. It is actually extremely important that a model refined against low-resolution data has perfect geometry since the information content of the diffraction data is so low. The authors are incorrect to state that poor geometry at low resolution "is the accepted wisdom in protein crystallography". The geometry for every part of every molecule was tightly restrained to the starting model using the DEN methodology, with a Cα r.m.s.d. of 0.4 Å. The PDB validation report also reveals that four out of five chains that have a rather poor fit to the electron density. The maps used in our analysis were scaled in CNS using the DEN script. The fit quality of the appropriately scaled map generated by CNS is excellent and exactly what would be expected at 5.9 Å. See the new Figure 4—figure supplement 2. The automated map calculation used by the PDB validation server does not use the same scaling procedure and so produces a much poorer map, and corresponding RSCC and RSR score values that do not reflect the actual fit to the CNS DEN map. A file of real space correlation coefficient (RSCC) and R-factor (RSR) values generated by CNS is attached. Most RSCC correlation values are well above 0.9. Moreover, the report indicates that the diffraction data suffer from a substantial twinning fraction and L-test statistical values that suggest twinning. It is likely that if the crystals were in fact twinned, it might explain the poor fit with electron density as reported by the PDB validation report, the poor fit of TAR into the difference electron density (Figure 4—figure supplement 1), and the absence of density of the Tat ARM. The presence of a substantial twin fraction makes the interpretation of difference maps notoriously difficult due to the inherent introduction of noise by twinning. The structure is not twinned. We inquired with the PDB and they stated that their automated analysis of twinning carried out by the validation server is not reliable at 5.9 Å resolution. The PDB ran additional checks that show there is no twinning. See also the output from CTRUNCATE and CNS (Author response image 4), all demonstrating zero twinning. It is not unusual for the initial difference density for a large missing substructure to be imperfect just after molecular replacement and the first round of refinement. Many authors don’t show these maps for this reason, but we consider it the proper thing to do. The 2Fo-Fc map shown in the new Figure 4—figure supplement 1 shows an excellent fit for the TAR RNA. Of course, the 2Fo-Fc map is, like any such map, potentially subject to model bias. We showed the difference map as a main figure despite its aesthetic imperfection because it is completely unbiased and the TAR RNA is by far the largest feature in the difference map. There is in fact a density feature at the expected ARM position, however it is not possible to model it with confidence and so did not seem appropriate to speculate about it in the manuscript. The wording about the ARM density at the bottom of pg. 7 is slightly more hedged in the revised manuscript. Moreover, models derived from twinned diffraction data are much more prone to potential model bias than for data without twinning. The only phases used for modeling RNA were calculated with the RNA absent throughout its previous refinement history. No rebuilding of protein was carried out at all, and no rebuilding of the RNA was carried out subsequent to its initial docking into the density. Model bias is not relevant in the context of this structure. In relation to this issue, the absence of electron density does not necessarily imply that the particular part of the complex is "flexible", but it may be a consequence of twinning. Thus, the conclusions drawn from this structure for the position and conformation of TAR and the Tat ARM must be viewed with great caution. The conclusion regarding the extended nature of the ARM and the exposure of its main-chain is drawn from the HDX data, not from the absence of density. There actually is some limited density, as mentioned above. We use the term “extended” rather than “flexible”. It may ultimately prove at higher resolution that the ARM is at least partly ordered via side-chain interaction. What is clear from the HDX is that at least the main-chain amide groups of the ARM must be exposed to solvent, which rules out a helical conformation for the ARM. We are grateful to Sarah Keane and Michael Summers for providing 5’UTR RNA and to Chris Jeans (Macrolab at UC Berkeley) for providing equipment for small-scale purification of proteins by size exclusion chromatography. We also thank James Holton for help with X-ray crystal data collection and processing at beamline 8.3.1 at the Advanced Light Source at LBNL. This work was supported by NIH grants P50GM082250 (JHH, JAD, and AS) and NIAID R01AI041757 and R01AI095057 (QZ). SAXS data were collected at the SIBYLS beamline (Lawrence Berkeley National Laboratory) which is funded by DOE/BER contract number DE- AC02-05CH11231 and NIGMS R01GM105404. Beamline 8.3.1 at the Advanced Light Source, LBNL, is supported by the UC Office of the President, Multicampus Research Programs and Initiatives grant MR‐15‐328599 and the Program for Breakthrough Biomedical Research, which is partially funded by the Sandler Foundation. The Advanced Light Source is supported by the Director, Office of Science, Office of Basic Energy Sciences, of the US Department of Energy under Contract No DE-AC02-05CH11231. This research continues a program begun by the late Thomas Alber, and we dedicate this paper to him. © 2016, Schulze-Gahmen et al.